The FDA Alert(s) below may be specifically about methocarbamol or relate to a group or class of drugs which include methocarbamol. Endo International plc (NASDAQ: ENDP) today announced that one of its operating companies, Endo Pharmaceuticals Inc., is voluntarily recalling two lots of Robaxin® (methocarbamol tablets, USP) 750mg Tablets 100 Count Bottle pack to the consumer level. 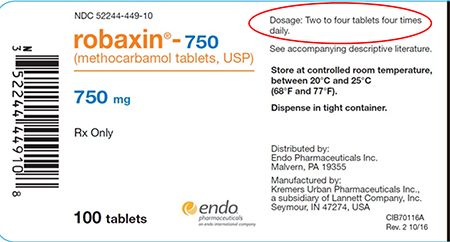 The products have been found to have incorrect daily dosing information on the label due to a labeling error which misstates the daily dose as "two to four tablets four times daily" rather than the correct dosage of "two tablets three times daily." (see picture below for location of incorrect text). Distributors, retailers and consumers with questions regarding this recall can contact Inmar by telephone at 1-866-391-0620 during the following hours: Monday through Friday (9am to 5pm ET) or by email at robaxin@inmar.com. Consumers should contact their physician or healthcare provider if they have experienced any problems that may be related to taking or using this drug product. Adverse reactions or quality problems associated with the use of this product may be reported to FDA's MedWatch Adverse Event Reporting program either by phone, on line, by regular mail or by fax. Reumofan Plus USA, LLC and Reumofan USA, LLC is recalling "Reumofan Plus" Tablets, Lot# 99515, exp. 09/16, because they contain undeclared active pharmaceutical ingredients: methocarbamol, dexamethasone, and diclofenac. The recall was initiated after it was discovered that the product was distributed in packaging that did not reveal the presence of the active pharmaceutical ingredients, making it an unapproved drug. One illness has been reported to date in connection with this problem. Samantha Lynn Inc. is voluntarily recalling 500 lots of Reumofan Plus Tablets to the consumer level due to findings of undeclared drug ingredients. The FDA sample analysis has found the product to contain methocarbamol and diclofenac. The affected Reumofan Plus lots may include the following lot number(s): 99515 ex096 and expires: 2016. The product is marketed in a green bottle containing 30 lavender round tablets and is distributed nationwide via the internet. FDA is issuing an updated alert that Reumofan Plus and Reumofan Plus Premium contain undeclared active ingredients found in prescription drugs that should be used only under the supervision of a health care professional. Because of the possible risks, consumers should not buy or start using these products. ISSUE: FDA is warning consumers that Reumofan Plus, marketed as a natural dietary supplement for pain relief and other serious conditions, contains several active pharmaceutical ingredients not listed on the label that could be harmful. An FDA laboratory analysis of Reumofan Plus found that it contains Diclofenac Sodium, a prescription non-steroidal anti-inflammatory drug (NSAID) that may cause increased risk of cardiovascular events such as heart attack and stroke, as well as serious gastrointestinal (GI) adverse events including bleeding, ulceration, and fatal perforation (causing a hole) of the stomach and intestines, and Methocarbamol, a prescription muscle relaxant that can cause sedation, dizziness, low blood pressure, and impair mental or physical abilities to perform tasks such as driving a motor vehicle or operating machinery. The Mexican Ministry of Health discovered that at least one lot of the product contains the corticosteroid dexamethasone, a drug that acts as an anti-inflammatory and immune system suppressant. FDA has received multiple reports of adverse events associated with the use of Reumofan Plus, including liver injury, sudden worsening of glucose control, weight gain, swelling, leg cramps, and adrenal suppression. BACKGROUND: Reumofan Plus is marketed as a natural dietary supplement for pain relief. Reumofan Plus is labeled in Spanish and promoted for treating arthritis, muscle pain, osteoporosis, bone cancer, and other conditions. The product is manufactured in Mexico by Riger Naturals and sold in some retail outlets, at flea markets, and on various internet sites. FDA has worked closely with the Mexican government on this matter. The Mexican Ministry of Health has issued a health warning to the public and ordered Riger Naturals to recall the product. RECOMMENDATION: Consumers who are currently taking or who recently stopped taking Reumofan Plus are urged to consult a healthcare professional immediately. Health care professionals are urged to ask their patients about use of Reumofan Plus and other products marketed as dietary supplements when patients present with unexplained symptoms that suggest NSAID toxicity, depression, or the use or abrupt discontinuation of corticosteroids. Additionally, health care professionals should evaluate patients who have used Reumofan Plus for drug and disease interactions involving diclofenac, methocarbamol, and corticosteroids, and consider whether a corticosteroid taper regimen may be appropriate in those who have used Reumofan Plus. ISSUE: The U.S. Food and Drug Administration (FDA) is warning the public that the potentially harmful dietary supplement product Reumofan Plus is being relabeled and sold under the name “WOW.” The product is being marketed to treat arthritis, muscle pain, osteoporosis, bone cancer, and other conditions. FDA laboratory analysis confirmed that “WOW” contains the same prescription drug ingredients that are in Reumofan Plus, including dexamethasone (a corticosteroid), diclofenac sodium (a non-steroidal anti-inflammatory drug), and methocarbamol (a muscle relaxant). These ingredients have the potential to cause serious injury. BACKGROUND: FDA warned the public of the harm of Reumofan Plus on June 1, 2012, and again on August 21, 2012. Since June, FDA has received dozens of adverse event reports, many of them serious, from consumers who used Reumofan Plus. The reports include liver injury, severe bleeding, corticosteroid withdrawal syndrome, adrenal suppression, stroke, and even death. Reumofan Plus and “WOW” products are sold on various websites, including www.gonepainfree.com and www.browerent.com. The products are manufactured by Riger Naturals S.A. In addition to websites selling “WOW,” FDA has become aware that various websites, including www.reumofanusa.com, owned by Reumofan USA, LLC, continue to sell Reumofan Plus even after previous FDA warnings. Please see the link to the FDA public warning for product photos. RECOMMENDATION: Consumers currently taking or who have taken Reumofan Plus or “WOW” should immediately consult a health care professional. Health care professionals are urged to ask their patients about the use of Reumofan Plus, “WOW,” and other similar products marketed as dietary supplements when patients present with unexplained symptoms that suggest NSAID toxicity, psychiatric changes, or the use or abrupt discontinuation of corticosteroids. Additionally, health care professionals should evaluate patients who have used Reumofan Plus and/or WOW for drug and disease interactions involving diclofenac, methocarbamol, and corticosteroids, and consider whether a corticosteroid taper regimen may be appropriate.